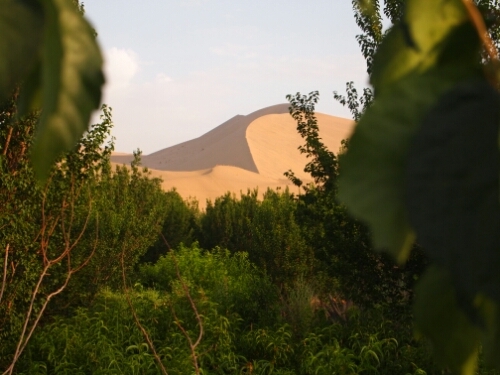 It turned out that we weren’t staying in Dunhuang itself but just outside of town right next to the sand dunes, which are one of the things the area is famous for. These were truly impressive with some of the dunes apparently rearing up 800m and looking very beautiful with the clear blue sky behind them. What was also interesting was how abruptly the oasis of the town ended and the dunes began, you could almost cross over a line from lush greenery into sandy desolation. The dunes were, unfortunately, a bit of a tourist trap with about ten caravans worth of camels offering rides as well as sand surfing and microlight flights. The dunes were also very expensive at about GBP12 to visit. Having already walked in the desert a few days before at Kumtag I decided to forego it again and enjoy them from a distance. That said, just behind the hostel I was staying in it was possible to walk on a part of the dunes before the fence blocking the park off started. I did this one night when Xiao, the Chinese cyclist I had been riding with, led me up there because he thought I said I was too hot when in fact I had just said I was going to the toilet. This was OK though as the view of the stars was extraordinary the night was so clear. In fact the sky almost looked cloudy it was so thick with constellations. 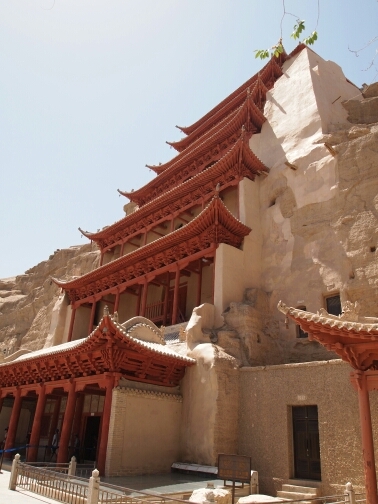 While in Dunhuang I also visited the Mogao Cave complex which is one of the most famous places for Buddhist art in China. It was very interesting, if a little touristy and the whole area had been done very well. Perhaps the most impressive cave contained a Buddha 37.5m high which was huge, especially enclosed in a cave as it was. Sadly you couldn’t take pictures from inside. I spent a couple of days in Dunhuang to recharge my batteries as I had gotten a fairly bad cold and to let my saddle sore heal up as much as possible. It was a pleasant town to do so in, with a lovely night market and plenty of places to eat. When it was time I to leave I headed off with Xiao one more time. We had through the mediation of people who spoke both English and Chinese worked out that we were now to part. 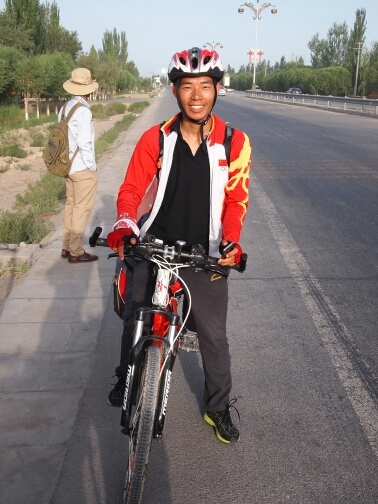 Xiao was to take a train from Dunhuang the 1100km to Lanzhou while I was to carry on cycling. This at least solved a mystery for me. I had been trying to work out how he cycle toured while only eating melons and an occasional bowl of noodles without collapsing in hunger. It turns out that this is possible if you take the train for 75% of the time! Leaving the hostel I was able to sit on my saddle without a permanent look of discomfort on my face and considered the second day in Dunhuang well spent. After about 20km (the train station is, as is common in this part of China, quite far from the actual town) I looked back to see Xiao waving in distress. As I pulled up it became apparent he had another puncture, number 3 in about 250km! As I stopped he gestured we should say goodbye and I should carry on as we were near the station anyway. I didn’t argue, he didn’t need moral support and I’d only get in the way if I tried to help! So off I went riding solo once more. And I absolutely flew down the road from Dunhuang back to the main highway through the province of Gansu. I really must have been feeling a bit sick when I left Urumqi as I felt so much stronger now and was making the sort of pace I expected when I sent ahead so much of my winter stuff. By the road I saw this beacon or watch tower from when I don’t know. They tend not to put signs in English for ruins in the desert in China. That day I made about 120km by lunchtime and decided to stop to wait out the heat of the day at the town at the junction of the Dunhuang road and the highway. Here I had some tasty Chinese sandwich equivalents, which is a sort of flat bread stuffed with pork. I also finally managed to get a Chinese SIM card on about the fifth attempt. This involved the staff calling up a local Chinese English teacher to come in and help. Disturbingly her English was terrible but just about adequate for me to get across what I wanted. And so with her kind help I finally had an internet enabled phone again. 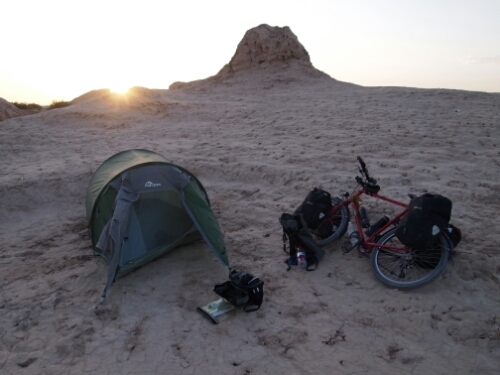 The next day I woke up very early in order to start riding at first light as it is wonderfully cool then and started off eastwards again riding up on the highway at the earliest opportunity as the old road that goes the same way was pretty rubbish. The route today thankfully was not all through desert and parts cut through areas which clearly had access to water. 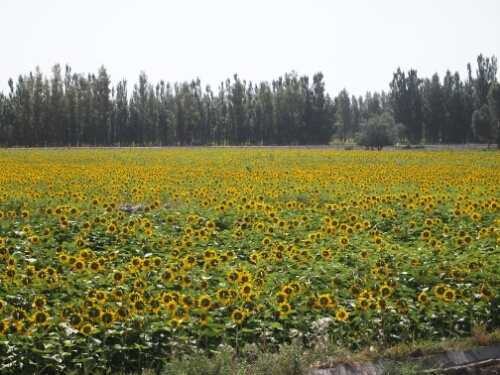 It was quite pretty and cheered me up a lot riding with trees in sight and even flowers. I realised that I had been riding for a long time with a very restricted palette. One that had contained mainly the yellows and browns of the desert and occasionally the greens of the mountains. It was good to see some bright yellows and reds for a change. There were also a lot more other touring cyclists now, before it had been rare to see any. Now I was sometimes seeing ten Chinese touring cyclists everyday. It was so common that we no longer stopped to say hello to each other. 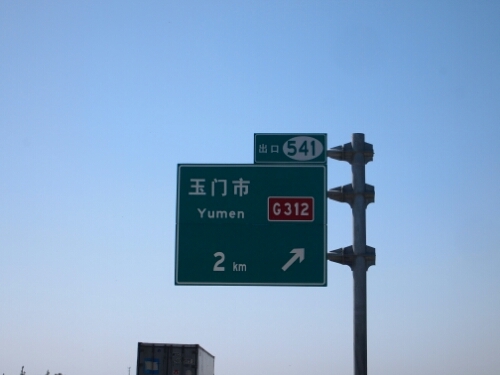 That day I would also ride past the town of Yumen, which had been quarantined a week early due to an outbreak of the bubonic plague. Needless to say I didn’t take the exit for a look around. I was though slightly disappointed that there weren’t military vehicles everywhere or any hordes of people turned into zombies by the plague. 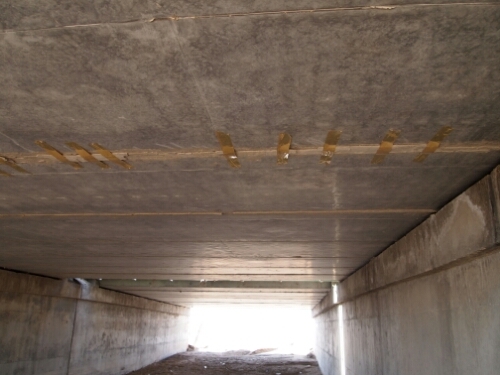 That evening I would make it to Jiayuguan and enter what is known as the Hexi Corridor. This a narrow strip of land between two mountain ranges that leads for some hundreds of kilometres into what can be considered Imperial China. 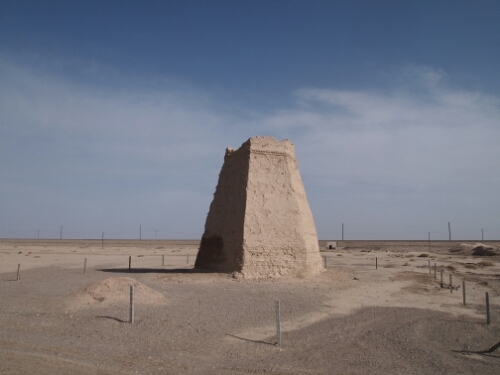 The city of Jiayuguan marks the end of what was considered for a long time true China, everything beyond it was considered to be nowhere full of ghosts and barbarians. A fort was constructed here in 1372 and this was seen as being the mouth of the empire and the symbolic end of the Great Wall. Riding past this fort and the sections of the Great Wall that remain was very evocative and I felt in some ways I was really returning to civilisation. The western gate of the fortress is known as the Gate of Reconciliation and was where undesirables rode off into exile from Imperial China. Having ridden through some of the lands they would have to cover once they left the fortress I can confirm it was definitely a terrible punishment. After Jiayuguan I really did feel like I was back in some form of civilisation or at least somewhere with a bit more life. The desert was fading and now there was more greenery and trees and crops than anything. It was one of the nicest day’s riding I had had in a long time. The weather was even in my favour with a cool breeze that kept the temperature down around the mid 20s rather than the mid 30s as I was used to. While riding from Jiayuguan to Zhangye my next destination I ran into my first European cycle tourist on the road since Kyrgyzstan. This was Tobias, a young German with easily the most incredible touring bike setup I had ever seen. When I saw him coming towards me up a slight hill I thought it wasn’t a cyclist as he was going too fast, as we talked the reason for his speed became clear. 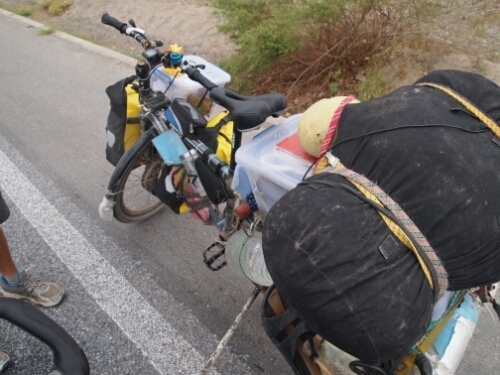 He had been living in Kunming and had decided to ride back to Germany, as you do. Tobias had a problem though. He had time constraints on his trip and so instead of taking the train for part of the way like most people he instead set to work creating an awesomely fast bike. Using a cheap Giant mountain bike as a base he put motors on the front and back wheels and built a large back rack out of bamboo in order to carry the huge amounts of battery packs he needed to power the motors. The weight was incredible, he estimated it at about 120kg! With the assistance of the motors he said he was able to travel at an average of 40kph but normally travelled at around 33kph to conserve power. This speed was unaffected by wind or gradient as well! To put it in context I am ecstatic if I average 20kph over a day. The only issues he had were keeping the batteries charged and the weight of course. Impressively he said his range was about 180km between charges and that it only took an hour and a half to charge. This sounded incredible to me and I hope he manages to make it back to Germany! 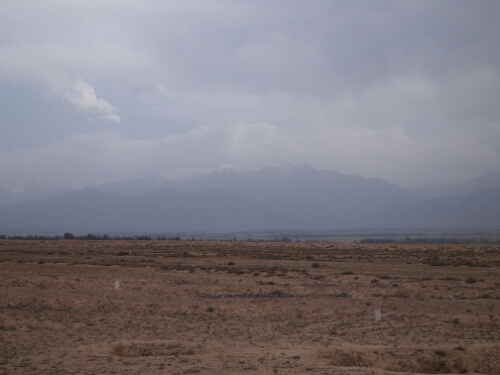 As I had been riding the past few days there were the mountains of the Qian Shan range on my right. Unfortunately due to haze from pollution I had barely been able to see them. This is a big problem in China even in the relatively unpopulated lands in the west. Riding on, I managed to make it to Zhangye two days after leaving Jiaguyuan and was happy to arrive as I would be having a rest day there. I would also be meeting Meka again who had decided to take a train back to ride with me once more, which was nice.